Radiative Equilibrium or Radiative Poppycock? barrier... in obedience to this “law”. This notion originates from a long-ago misconception about how glass greenhouses work, thusthe family name this "effect" goes by. It was believed that glass blocked the passage of "dark radiation" (infrared) and kept storing energetic photons inside it. Once those photons had accumulated enough power to overcome the glass barrier, radiative equilibrium was achieved. overhead in illustrations about the “greenhouse effect”, when in fact these molecules are at their densest concentration right at your feet? How long does carbon dioxide linger in the air? This is actually an important question, a question of so-called residence time. As previously discussed on this blog, studies compiled by geologist Tom Segalstad rather convincingly show that earth’s biological and chemical processes recycle CO2 within a decade, meaning that a CO2 molecule you’re exhaling at the moment is bound to be captured by a plant or a rock or the ocean just a few years from now. Yet the Intergovernmental Panel on Climate Change and other authorities insist that carbon dioxide generally remains in the air for up to 200 years. Who to believe? We’ll present some evidence here and you be the judge. While Dessler and Trenberth (among others) claim clouds have an overall positive feedback warming effect upon climate due to the long-wave back-radiation, this new paper shows that clouds have a large net cooling effect by blocking incoming solar radiation and increasing radiative cooling outside the tropics. Now, I always focus on the basic claim that back-radiating greenhouse gases make the earth’s surface warmer. The earth’s SURFACE. 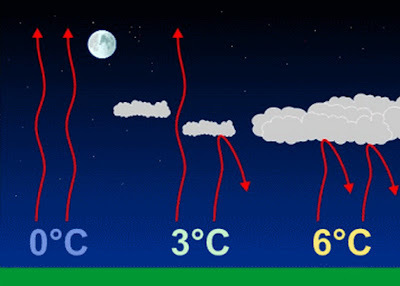 Liquid clouds are often included as greenhouse agents because at nighttime they’re thought to reflect heat rays back to the earth and at least retard surface cooling if not actually raise the temperature. In other words, the same heating mechanism, that of back-radiation, is attributed to clouds because ‘radiative forcing’ theory assumes that opposing flows of infrared actively warm the surface —and always the surface alone, please note. Thus, for instance, Lindzen argues that 240 watts from the surface matched by 240 from the sky will make the surface radiate 480 watts per each square meter. But won’t make the sky radiate 480 in turn. Summary: The IPCC expresses virtual certainty that a glaciation is not possible for the next 50 Kyr if CO2levels remain above 300 ppm. It is the long interglacial hypothesis. Analysis of interglacials of the past 800 Kyr shows they depend on obliquity-linked summer energy, ice-volume, and eccentricity, and they end at glacial inception after ~ 6000 years of Neoglaciation-type temperature decline. The lag between orbital forcing and ice volume change indicates the orbital threshold for glacial inception is crossed thousands of years before glacial inception, and the Holocene went through that threshold long ago. In the absence of sufficient anthropogenic forcing glacial inception should take place in 1500-2500 years. The long interglacial hypothesis rests on the wrong astronomical parameter, high-equilibrium climate sensitivity to CO2, and uncertain model predictions of very long-tailed CO2decay. It is not possible to determine at present if a glacial inception will take place over the next millennia. The precautionary principle indicates we should prepare for that eventuality as it would constitute the worst catastrophe humankind has ever faced.